Pigs fed pelleted diets had greater gain-to-feed ratio than pigs fed diets in the meal form and these pigs also had greater back fat than pigs fed diets in the meal form. The nutritional value of corn distillers dried grains with solubles may vary depending on the concentration of oil in the product. Conventional DDGS usually contains at least 10% crude fat whereas low-oil DDGS contains 6% to 9% crude fat, resulting in other nutrients being more concentrated. Dakota Gold is a low-oil DDGS that is produced by Poet (Sioux Falls, S.D.). With more corn oil extracted from the solubles at the ethanol plants, a heat-free process using a cold fermentation technic called BPX is used to obtain Dakota Gold DDGS and it is possible that this technique will positively influence nutrient utilization. Pelleting is one of the feed technologies that is commonly used in the swine feed industry. By pelleting diets, improved handling properties including an increase in bulk density of feeds, a reduction in dust, and a decrease in ingredients segregation and feed wastage are expected. Growth performance of pigs may also be improved by improving feed efficiency and nutrient digestibility if proper heat, moisture and temperature are applied. However, some amino acids including Lysine or Arginine can react with a reducing sugar during heating, and therefore, digestibility and utilization of amino acids can be decreased. 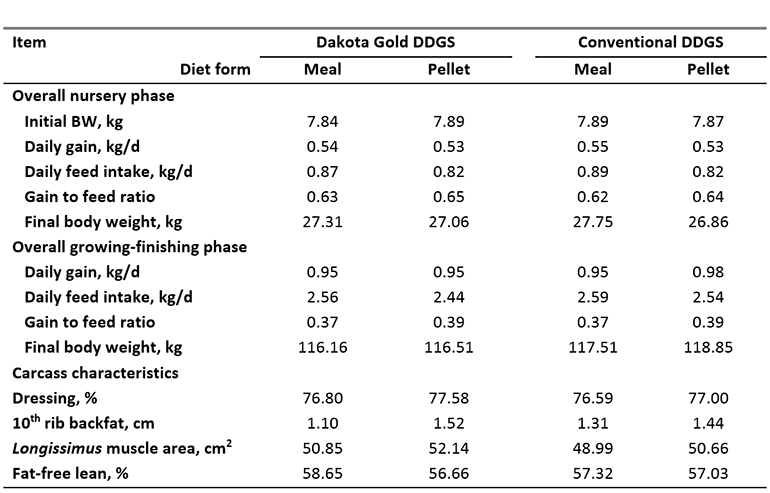 It is, therefore, possible that the nutritional value of DDGS containing diets may be improved if they are pelleted, but it is not known how pelleting influences the nutritional value of Dakota Gold DDGS compared with conventional DDGS. Therefore, three experiments were conducted to test the hypothesis that the nutritional value of Dakota Gold DDGS is not different from that of conventional DDGS. The CP in Dakota Gold and conventional DDGS were 28.0 and 26.2%, respectively, and Lysine concentrations were 0.96% and 0.84% in the two sources of DDGS (Table 1). As a consequence, the Lys:CP ratio was 3.43 in Dakota Gold DDGS and 3.20 in conventional DDGS indicating that neither source of DDGS was heat damaged during drying. The GE in the Dakota Gold DDGS was 4,442 kilocalories per kilogram, but in the conventional DDGS, GE was 4,831 kilocalories per kilogram, which may be attributed to the greater concentration of fat. Table 1: Analyzed nutrient composition of Dakota Gold and conventional DDGS (88% DM basis). Two experiments were conducted to determine the standardized ileal digestibility of CP and amino acids (Experiment 1) and the apparent total tract digestibility of NDF, acid hydrolyzed ether extract as well as the ME of diets (Experiment 2). Greater SID of CP, Lysine and most other amino acids was observed in Dakota Gold DDGS compared with conventional DDGS (Table 2). It is possible that the fact that Dakota Gold DDGS is produced using the BPX technology that does not include cooking of the grain results in increased SID of amino acids. 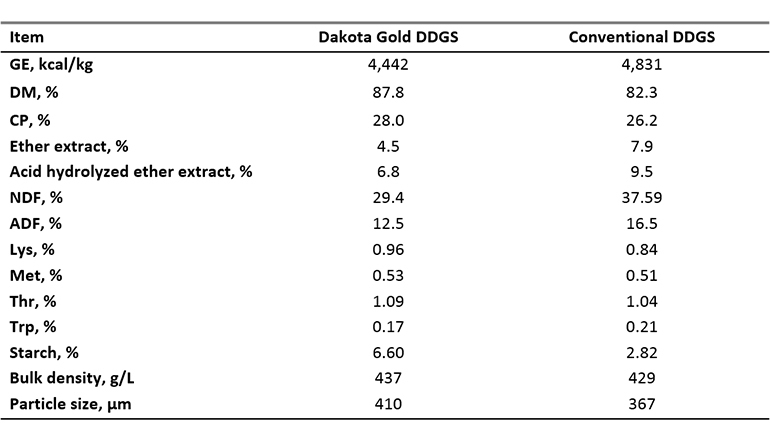 The ATTD of NDF and acid hydrolyzed ether extract was greater in conventional DDGS than in Dakota Gold DDGS, and conventional DDGS contained more ME than Dakota Gold DDGS. It is not clear why the ATTD of NDF was less in Dakota Gold DDGS than in conventional DDGS. However, it is possible that the BPX technology that is used in the production of Dakota Gold DDGS results in more of the fermentable fibers being fermented in the ethanol plant with a resulting lower concentration of these fractions in the DDGS that is produced. Table 2: Standardized ileal digestibility and apparent total tract digestibility of nutrients and ME concentrations in two sources of DDGS. In Experiment 3, a total of 160 weanling pigs were fed a common Phase 1 diet for seven days post-weaning and then allotted to a 2 x 2 factorial design with two sources of DDGS (Dakota Gold or conventional) and two diet forms (meal or pelleted). There were four pigs per pen and 10 pen replicates per treatment. Phase 2 diets were fed from Day 7 to 21 post-weaning, and a Phase 3 diet was fed from Day 21 to 46 post-weaning. Pigs were then moved to a growing-finishing facility and provided grower diets, early finisher diets and late-finisher diets. Phase 2 diets contained 15% DDGS and all other diets contained 30% DDGS. All diets were formulated based on the results for SID of amino acids and the ME that were obtained in Experiments 1 and 2, and the same batches of the two sources of DDGS were used in all experiments. To compensate for the reduced SID of amino acids in conventional DDGS compared with Dakota Gold DDGS, more synthetic amino acids were used in diets containing the conventional DDGS. However, diets were not isocaloric and the reduced ME in the Dakota Gold DDGS, therefore, resulted in the Dakota Gold diets containing less ME than diets containing conventional DDGS. During the overall nursery and growing-finishing phases, pigs fed meal diets had greater feed intake than pigs fed the pelleted diets (Table 3). This may be because feed wastage was reduced in the pelleted diets. The gain-to-feed ratio was, therefore, improved for pigs fed pelleted diets compared with pigs fed meal diets. Growth performance did not differ between pigs fed the two sources of DDGS. The overall growth performance of all pigs was excellent during the growing-finishing period indicating that if diets are formulated on measured values for digestible amino acids in DDGS, excellent growth performance of pigs may be obtained with 30% DDGS in the diets. Table 3: Overall growth performance and carcass characteristics of pigs fed diets containing DDGS. There were no differences between pigs fed diets containing Dakota Gold DDGS and the conventional DDGS in any of the carcass characteristics measured. However, 10th rib back fat was greater for pigs fed pelleted diets than for pigs fed meal diets. There were also greater fat-free lean percentage in pigs fed meal diets compared with pigs fed pelleted diets. In conclusion, concentration and digestibility of most amino acids were greater in Dakota Gold DDGS than in conventional DDGS, but the digestibility of fiber and fat and concentration of ME were less in the Dakota Gold DDGS than in the conventional DDGS fed to growing pigs. However, use of Dakota Gold DDGS diets fed to pigs from one week post-weaning to market did not affect growth performance or carcass characteristics, indicating that the reduced ME of the Dakota Gold DDGS did not result in a measurable reduction in growth performance. However, pigs fed diets that were pelleted had greater gain-to-feed ratio than pigs fed diets in the meal form and these pigs also had greater back fat than pigs fed diets in the meal form. Does good pellet quality enhance finishing pig performance?